President Trump held a meeting earlier this summer with the Secretary of Health and Human Services (HHS), the Director of the Office of National Drug Control Policy (ONDCP), and other advisers to take a deep dive into solving the nation’s worsening opioid overdose problem. The Trump administration is clearly shifting into high gear on this issue. HHS Secretary Price, for example, agreed with a reporter during the press briefing that followed, when the reporter called it a “national emergency.” Even more disturbing, however, were recent assertions made by New Jersey Governor Chris Christie in a recent interview. Christie, who heads a White House Drug Addiction Task Force, claims that in 2015 doctors prescribed enough opioid painkillers to medicate every American adult for 3 weeks. If these numbers appear implausible or like they are missing some context, it’s because they are. And the Administration’s resorting to hyperbole creates an atmosphere of panic that is likely to lead to policies that will only make matters worse. Let’s start with the context-dropping. What does the governor mean by “medicated?” To a practitioner “medicated” means being treated with a medicine in order to achieve a desired result. Does that mean one 5mg oxycodone tablet every 4 hours (6 per day) for 21 days? 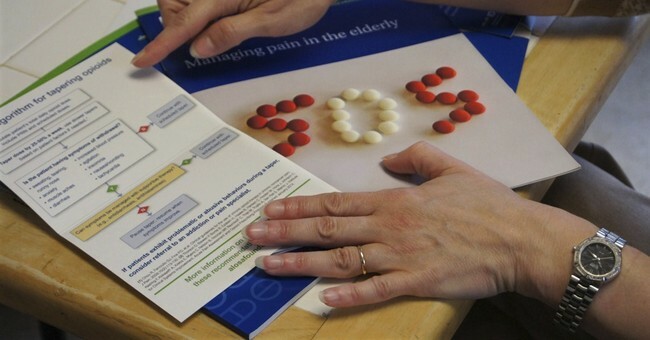 Some patients are prescribed two 5mg tablets every 6 hours. Or is he talking about 7.5 or 10 mg oxycodone tablets? Maybe he means hydrocodone. That also comes in 5mg, 7.5mg, and 10mg doses and is sometimes prescribed every 4 hours but sometimes every 6 hours. Then there’s hydromorphone (dilaudid), oxycontin, and let’s not forget codeine. The point is, millions of Americans have genuine, medically necessary reasons to be taking opioids. They make up the vast majority of opioid users and it doesn’t make sense to lump them into the opioid crisis. And opioid use itself, for medical purposes or otherwise, is indeed decreasing. In July the Centers for Disease Control (CDC) reported that prescriptions for opioids by health care providers have been coming down. And the National Survey on Drug Use and Health (NSDUH) has reported that nonmedical use of prescription opioids peaked in 2012 and has been steadily dropping. That’s not to say the problem is resolving itself. Unfortunately deaths from opioid overdose have been steadily increasing, reaching a new peak of 33,000 in 2015. For the first time the majority of those deaths were from heroin overdose, and the death rate from fentanyl overdose comprised over 4,000 of those deaths. Meanwhile, overdose deaths from prescription opioids have stabilized. With the crisis already this severe, it’s crucial we get the facts right. Frightening and imprecise rhetoric leads to hastily designed policies with unintended consequences, often making matters worse. Not all solutions are created equal. States have made the opioid antidote naloxone more available to chronic pain patients and to first responders. And more money is being spent on rehab programs. But so far most proposals for dealing with the overdose problem focus on increased surveillance on patients and providers, inducing doctors to prescribe fewer opioids, and making manufacturers cut back on the amount of opioids produced. No matter how much regulators clamp down on the medical use of opioids the overdose rate grows. Yet the overwhelming majority of overdose victims are not patients receiving opioids for pain. Less than 1% of well-screened patients become addicted to opioids, according to a 2010 Cochrane analysis. A less comprehensive 2015 review from researchers at the University of New Mexico found the addiction rate ranged from 8-12%. And the CDC has cited a recent study showing the risk of overdose in non-cancer patients chronically receiving opioids for pain at less than 0.2 percent. In fact, it’s fair to say that many of the deaths from opioid overdoses are the result of drug prohibition. Opioids obtained on the black market are often counterfeit and frequently laced with dangerous additives, such as fentanyl and carfentanil. The dosages are unknown or unreliable. Prohibition also increases profits to drug dealers peddling cheaper and more powerful narcotics. If policy makers in the Trump administration want to effectively address the problem, there are other ways to do it. They should promote “harm reduction” programs, including pilot “heroin maintenance” programs, such as those that have worked successfully in Switzerland, the UK, Germany, the Netherlands, and Canada. They should also take note of recent evidence from Johns Hopkins University, the University of Michigan, and the RAND Corporation that have shown a dramatic decrease in opioid use and overdose rates in states that have legalized marijuana for medicinal use. The opioid overdose problem requires a calm and reasoned approach, and a willingness to admit to previous policy mistakes. Rhetoric aimed at frightening the public does not foretell a propitious start.